Avoid Android Malware: A Visual Guide for BusinessAftermarket Ink and Toner Costs: Too Good to be True? The 1981-released IBM PC-5150 (shown above) is a productivity tool as groundbreaking as Henry Ford’s magneto assembly line. Legendary indeed, but the 5150 almost tanked IBM. Back then, IBM’s PC gave office professionals plenty of compute power for file management, document production, and database work. Its $1,500 price tag might classify it as the first workstation computer as we know them today. It was never intended to compete against Jobs and Wozniak for home use: after all, IBM stands for International BUSINESS MACHINES. The 5150 targeted enterprises and medium-size businesses with the look of the emergent home PCs of the time. 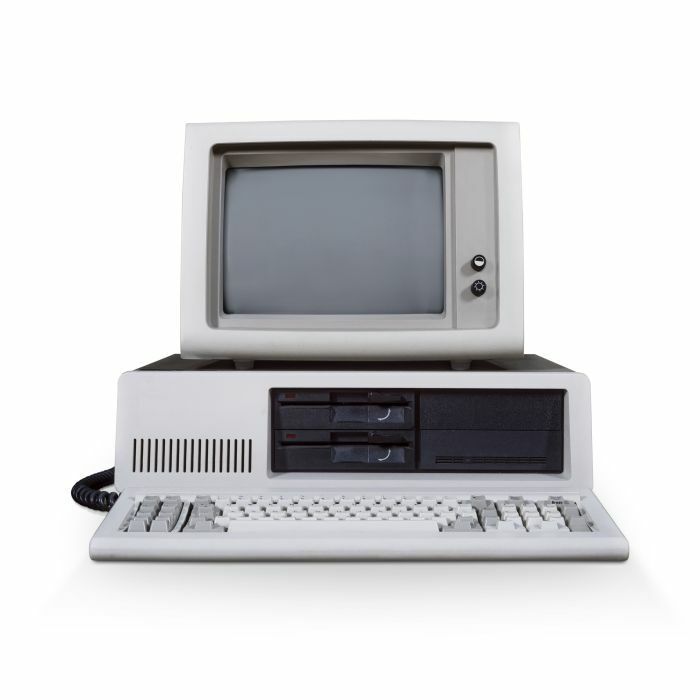 With its sibling computers, the IBM AX and dual-monitor supporting IBM AT, IBM PCs owned the B2B market. Unprecedented for IBM, the company published motherboard schematics for PC-5150 so third party vendors could design add-ons. Until then, IBM made its own custom components. For a more competitive price, IBM sourced the x86 CPU from Intel and turned to Japan for peripherals. It came with a Toshiba monitor and an Epson printer. The innovative BIOS-mounted firmware designed to support Bill Gates’ MS-DOS, which IBM sold pre-installed at a lower price than if purchased separately. The same way that PCs come with Windows 10 Pro today. IBM decision-makers worked from the assumption that giving OEMs bus and BIOS specs weren’t enough to reverse engineer replica machines. That was an epic miscalculation, as IBM would soon learn. IP suits went into the courts, and judges maintained reverse engineering from open source architecture is not an IP violation. The Compaq Mobile (1982) cloned IBM PC hardware for what we might call the first PC laptop. Back then, computers of the type were called ‘luggables’ because they folded up like a suitcase when traveling. A harder blow to IBM came when Compaq delivered first with a PC using the latest 8086 Intel CPU. Intel 386 VitualMode technology made multi-tasking with different applications possible. Microsoft took advantage by writing Windows 1.0 for 386 PCs. The early 80s began a decade-long skid from IBM. It descended from near-Monopoly to almost-bankrupt; in 1993 IBM reported $5 billion in annual losses in FY 1992. IBM powered through by maintaining leadership for mainframe and super computers for large enterprise and federal government. As OEMs scrambled to release their own desktops PCs the industry grew more commoditized. The drawback of the race to the lowest price meant fewer custom-build options and more off-the-shelf configurations. Tech savvy enthusiasts took a DIY route and purchased specific components themselves. Intel ATX motherboards, big and roomy cases, high-wattage power supplies, performance graphics cards, and more. The same paradigm applies today. Unless it’s a high power gaming PC or scientific workstation, building a PC for work is an unlikely route for a business to take. IT pros still do it out of principle, but for mainstream desktops the cost savings is often canceled by an OEM Windows license bundled in with HP, Dell, ABS, Toshiba, and other office PCs found on NeweggBusiness. The Ford Model T of the office PC, the IBM PC-100 is a productivity tool as groundbreaking as Henry Ford's interchangeable parts and magneto assembly line. Legendary indeed, but the 100 tanked IBM's PC division. How and why did that happen? The first IBM PC wasn’t the PC-100, it was the 5150. The PC-100 came out in 1994 and only in selected markets. Also, it wasn’t really considered a workstation, and true workstations were already available from manufacturers such as Apollo, DEC and Symbolics.